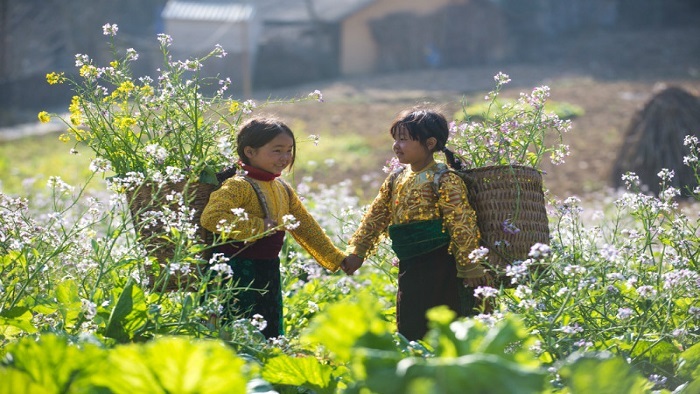 Tripadvisor travel magazine (United States) is introducing attractive destinations in the famous tourist area of Sa Pa (Vietnam) in the spring with the comments of visitors when visiting these places. 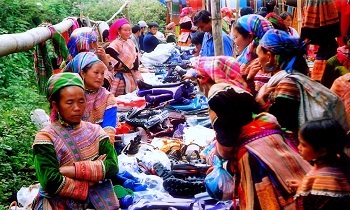 In this article, we will introduce 9 destinations many visitors to Sa Pa discover with the most remarkable comments. 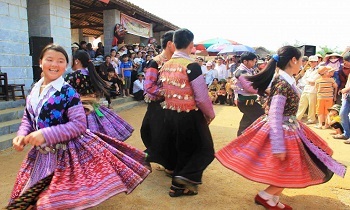 Great experience of North West mountain culture, especially the Red Dao ethnic group. 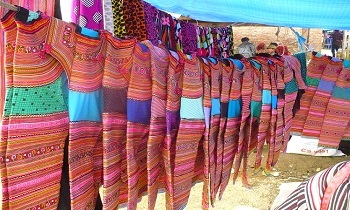 Do not forget to bathe with Dao medicinal herbs in the village and buy some gifts for friends and family. 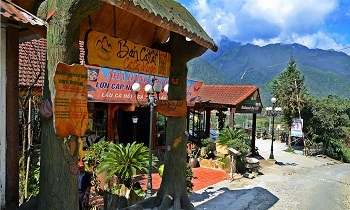 According to Sapa Vietnam tours review, the price in the village is cheaper than that in the market but the quality is excellent. Near Ta Phin village, there is a Ta Phin Cave. The cave entrance is about 5m high and 3m wide with a path down to the ground. Inside the cave, visitors will see rocks like the mother is holding children, some like the fairies and the others like giant raspberries... At the widest spot in the cave, the stalactites hanging down such as curly lace, undulating, and jade glitter. In the depths, we encounter a large rock lying slightly on the stone imprinted the footprints of chicken and the right tops of the stone also bore the same indentations as the horse's foot. An opposite cliff, the French words are engraved with hard objects, up to this day, in spite of the dust of time, it is still read. Ta Phin Cave has many mysteries to us, need to be protected and preserved. From the height of about 100 meters, the waterfall is down like the hair of the 20-year-old girl. A waterfall is very beautiful. If you do not visit the Love Waterfall when coming to Sapa, it is regrettable. Love Waterfall is a famous waterfall located in San Tu Ho commune, 14 km from the center of Sa Pa town to the southwest. This is one of the starting points of the journey to conquer Fansipan. To reach the falls, visitors have to go deep into the forest, through the green forest. In March, the road leading to the falls became more beautiful thanks to the brilliant red of azaleas. All blends create a charming natural painting. After 20 minutes of moving through the forest and follow the red soil, visitors will encounter the Golden Stream. Just climb upstream is possible to witness the Waterfall of Love. 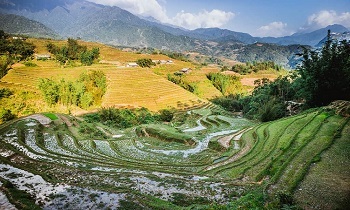 Muong Hoa valley with ethnic villages of the Hmong, Giay, and Dao with the very beautiful winding terraced rice fields. 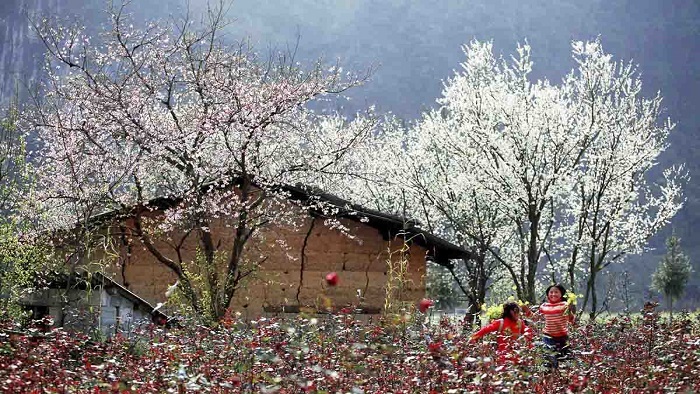 Like other parts of the northern mountainous region, the period from late May to early October is the best time to enjoy the terraced fields. What a very colorful picture! 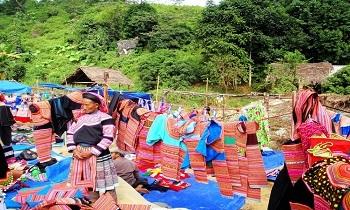 You will visit the traditional house of the Mong people and buy the products here such as textiles, dried meat, silver carvings, essential oils and learn how to operate rice mortar by water. The center of Cat Cat village has waterfalls and rice mortar by water. The water here is so clear that you can see the bottom. The first strange that visitors can easily recognize when first arrived in Sa Pa Mountain is the pretty town square which is in the center of the unique stone church, strangely with the garden in the shape of a horseshoe. The stairs look like an ancient Roman arena or a bicycle rink in Hue or a soccer field in Can Tho. 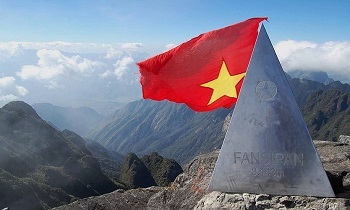 Fansipan is the highest mountain not only in Vietnam but also in all three Indochina countries, I think everyone should go to the top of Fansipan at least once in their lives. Besides, Sa Pa view from the cable car is very beautiful. Many white clouds surround you, making you feel like you are entering the realm. You should also choose to climb up the top of Fansipan on a sunny day because the vision will be much wider. Going from O Quy Ho Pass to Lai Chau, it must say that nature is so majestic and the clouds are as picturesque. The route of O Quy Ho Pass is great and worth a try. Ham Rong Mountain is located near the ancient stone church in the center of Sa Pa town. This is one of the most attractive natural attractions in the "City of Mist". Climbing up the mountain gives us a feeling of great pleasure. Conquer the mountains and enjoy nature. Here there are countless flowers, plants, and medicinal plants. The forest orchid with strange flowers from many places is brought here. The garden of 12 animal-designation statues and the flower garden center with a lot of beautiful flowers, Heaven Gate, Cloud Field ... and the area watching the "Ham Rong" look like a colorful picture that is as high as interesting. Ham Rong Mountain is also a beautiful shooting destination. Wandering through a landscape with picturesque terraced fields, we arrived at Sa Pa ancient rock reserve in Ta Van, Hao Thao. Right next to the road, the most ancient rock has been fenced for protection. However, the thing tourists also try to understand is the mysterious ancient carvings on the rock. This is the attraction of this ancient stone. Down the slope, the large rocks scattered in the valley and the mysterious carvings still always create great curiosity for visitors. There is no solution and these rocks will remain as rocky as to welcome many visitors to explore. We hope that your trip will be fun with 9 suggestions above. 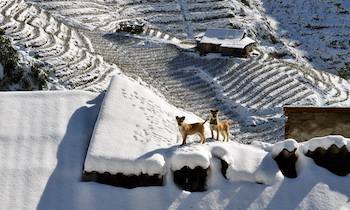 If you have any question about Sapa day tour price, feel free to contact us!